simple and unproblematic way. Second, after the reboot of my system (a"not-so-new" Acer Aspire 3634 laptop) I discovered with pleasure thatthe "suspend mode" was now fully supported! I did appreciate also the new notification system (ok, it seems has been copied from Max OS.. but if something is good, why not to copy it? 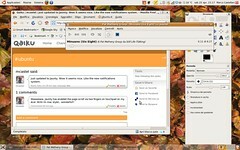 ), working with a semitransparent window that opens at the top right of the desktop. Very useful, and I just discovered applications that take fully advantage of this new feature. Overall, my assesment is (as you can easily guess) quite positive. Reflecting on the different models of microblogs (those websites where you send frequent status updates, usually no larger than 140 characters), it seems to me that there is, beyond the subtle distinctions between the various platforms, a basic distinction can be made between two types of conversational models: one in which you can add actual comments to a given status, and another where you can only comment by "answering" with another status message, addressed to the person you want to respond. Twitter itself has many advantages and peculiar characteristics, but here I want just to highlight how the conversational model is adopting may sound restrictive in many cases. Just an example, to clarify my point: let's suppose that - taken a beautiful day by a irrepressible curiosity - I write down in my preferred microblog the question "do you prefer orange or lemon juice?" If I am in a Twitter-like microblog, each user will respond with a message in his own microblog, with a link to my question. My dear friend (so to say) Ciccio Baciccio - which closely follows all my status updates - will see, however, only those responses whose extenders are by chance also his contacts. Those of others (which I do not reply directly to my turn, then producing a link to them) are not visible at all, for Ciccio Baciccio. He can't even guess their number. Not a great problem, ordinarily. Unless he is interested, for some reason, to the full spectrum of responses to my important question, regardless of who is the sender of the items. On the other hand, on a "conversational" platform, all the answers collected so far would be present, sorted by time, appended to my original post. And readily available, without having to "jump" from one site to another, in addition. Imagine a post that collects enough feedback (here is an example in Jaiku, or another in Qaiku), how might it became a complex thing in Twitter (for the latter of course I can not put a link, bacause is not contained in one page only). This is not to say that one approach is necessarily better than the other: instead, it is conceptually different (it's not correct to compare apples with pears, as they also teach at school).